As we predicted over three years ago in our book The Age of Deleveraging: Investment strategies for a decade of slow growth and deflation, and in many Insights since then, economic growth of about 2% annually will probably persist until deleveraging, especially in the financial sector globally and among U.S. consumers, is completed in another four or five years. Deleveraging after a major leveraging binge and the financial crisis that inevitably follows normally takes around a decade, and since the workdown of excess debt commenced in 2008, the process is now about half over. The power of this private sector deleveraging is shown by the fact that even with the immense fiscal stimuli earlier and ongoing massive monetary expansion, real growth has only averaged 2.3% compared to 3.4% in the post-World War II era before the 2007-2009 Great Recession. Interview with Swiss Business TV on China Hard landing, commodities, Australia and Slow Growth. Wall Street analysts expect this margin leap to persist. In the third quarter, S&P 500 profit margins at 9.6% were a record high but revenues rose only 2.7% from a year earlier. In the third quarter of 2014, they see S&P 500 net income jumping 14.9% from a year earlier on sales growth of only 4.7%. But profit margins have been flat at their peak level for seven quarters. And the risks appear on the downside. Productivity growth engendered by labor cost-cutting and other means is no longer easy to come by, as it was in 2009 and 2010. Corporate spending on plant and equipment and other productivity-enhancing investments has fallen 16% from a year ago. Also, neither capital nor labor gets the upper hand indefinitely in a democracy, and compensation's share of national income has been compressed as profit's share leaped. In addition, corporate earnings are vulnerable to the further strengthening of the dollar, which reduces the value of exports and foreign earnings by U.S. multinationals as foreign currency receipts are translated to greenbacks. The Federal Reserve usually starts to raise its federal funds rate before economic expansions are very old. This time, however, any move toward higher rates will probably have to wait until the wave of deleveraging, and the related slow growth, has ended. Continuing annual growth in real gross domestic product of about 2 percent compares with a rate of 3.4 percent in the post-World War II years through 2007, when the recession began. Under normal circumstances, deleveraging after major financial crises takes a decade to complete; this round started in 2008, and it has four or five years to go. Meanwhile, I believe Treasury yields are more likely to go down than up. First, persistent slow growth, gridlock in Washington, business uncertainty, and ample supplies of capacity and labor on a global scale mean the U.S. employment situation will probably remain weak. The Fed has said it wouldn’t raise its federal funds rate until the unemployment rate -- now 7 percent -- comes down to 6.5 percent. That target is becoming less meaningful, however, because the decline in joblessness has been primarily the result of a falling labor participation rate, not rising employment. If the participation rate hadn’t dropped from its February 2000 peak because of the retirement of members of the baby-boom generation, discouraged job-seekers and youths who have stayed in school during the recession, the unemployment rate now would be 13 percent. As investors increasingly grasp the Fed’s falling unemployment rate target, Treasury yields -- which have anticipated a rise in interest rates -- will probably continue to decline. Inflation is close to zero and deflation is probably only being forestalled by huge fiscal and monetary stimulus efforts. But that stimulus has been replaced by fiscal drag, resulting in the shrinking federal deficit. In addition, the impending Fed tapering of its bond purchases won’t tighten credit by reducing excess bank reserves, but it will reduce the monthly additions to that $2.4 trillion trove. With inflation this close to zero, it won’t take much of a hiccup to rattle the economy. And deflation is distinctly beneficial to Treasuries. I’ve believed for some time that there is an unsustainable gap between investors’ focus on Fed largesse and their lack of interest in limping economic performance -- a state of mind I call the “Grand Disconnect.” There’s been a close correlation between the rising Standard & Poor’s 500 Index and the expanding balance sheet of the Fed since the central bank started flooding the economy with money in August 2008. I’ve also been expecting a shock to end the Grand Disconnect and perhaps push the sluggish economy into a recession. Will the negative effects of the October government shutdown and debt-ceiling standoff, coupled with the confusion caused by the rollout of the Patient Protection and Affordable Care Act, provide that jolt? The initial Christmas retail selling season may be telling, and the risks are on the down side. I’m also focused on corporate profit, which may not hold up in the face of persistently slow sales growth, the lack of pricing power and increasing difficulty in raising profit margins. A substantial drop in stock prices will benefit Treasuries -- not because of the economic weakness and deflation that are likely to be generated by a bear-market-generating shock, but because investors will be drawn to the securities as the ultimate haven. Furthermore, stocks are vulnerable. The S&P 500 recently reached an all-time high, though corrected for inflation, it remains in a secular bear market that started in 2000. This reflects the slow growth since then and the falling price-earnings ratio, and it fits in with the long-term pattern. In May, when the Federal Reserve first started talking about reducing its $85 billion monthly purchases of Treasuries and mortgage-backed securities, yields jumped, to 2.72 percent in early July from 1.64 percent on May 1 for the 10-year note, and to 3.68 percent from 2.83 percent for the 30-year bond. Yields stabilized after Fed officials took note of the panic and said any withdrawal of stimulus spending would begin only when the economy was stronger. Although central bankers vigorously denied that the tapering of bond purchases signaled an impending rise in interest rates, investors didn’t believe them. Many interest-rate forecasters have insisted that the three-decade decline in U.S. Treasury bond yields is over, and they may be right -- finally. Yields on the 10-year note and the 30-year bond remain close to the recent highs reached two years ago. Then again, the Treasury bears have been proclaiming the end of the bond rally since rates began to decline in 1981. In those days, few people agreed with me that inflation -- still running at more than 10 percent -- was unwinding and that interest rates would fall. The consensus called for rates to remain high or even rise indefinitely. Yet when 30-year yields peaked at 15.21 percent in October 1981, I said that inflation was on the way out and that “we’re entering the bond rally of a lifetime.” Later, I forecast a drop to a 3 percent yield. Then, too, other forecasters thought I was crazy. Most investors have a distinct anti-Treasury bond bias, and not just because they believe that serious inflation and leaping yields are inevitable. Stockholders hate these securities because they don’t understand them. But their quality as investments has been unquestioned, at least until recently, and their prices rose promptly in 2011 after Standard & Poor’s downgraded the U.S.’s credit rating. Treasuries and the forces that move yields are well-defined: Fed policy and inflation or deflation are among the few important determinants. Stock prices, by contrast, are much more difficult to assess. They depend on innumerable variables, including the business cycle, conditions in a particular industry, legislation, the quality of company management, merger and acquisition possibilities, corporate accounting, pricing power and products. Stockholders do understand that Treasuries typically rally under weak economic conditions, which are negative for stock prices, and they consider declining Treasury yields to be a bad sign. It was only individual investors’ extreme distaste for stocks after the 2009 rout that precipitated the rush into bond mutual funds that year. Moreover, brokers don’t want to recommend Treasuries because commissions on them are low, and investors can avoid commissions altogether by buying them directly from the Treasury. Those who worry more about inflation than deflation also hate bonds, which tend to fall in price as inflation increases. People who work in finance on Wall Street also disdain Treasuries. I learned this many years ago when I worked at Merrill Lynch & Co. and White, Weld & Co. Investment bankers didn’t want me to accompany them on client visits if my forecast was for lower interest rates. They wanted projections of higher rates that would encourage corporate clients to issue bonds immediately instead of waiting for lower financing costs. A similar dynamic is at work today as investors and companies anticipate Fed tightening and higher interest rates. Managers of bond funds are sober professionals who always worry about inflation, higher yields and subsequent losses of principal in their portfolio. But if yields fall, they don’t rejoice over bond appreciation; they worry about reinvesting their interest coupons and maturing bonds at lower yields. This negative view of bonds, especially Treasuries, persists despite their vastly superior performance compared with stocks since the early 1980s. Starting then, a 25-year zero-coupon Treasury, rolled into another 25-year bond to maintain the maturity, beat the S&P 500, on a total return basis, by 5.3 times, even after the recent substantial bond selloff. And that’s despite the stock rally from 1982 to 2000. I’ve never bought Treasuries for their yield. I only care that it is going down. I want Treasuries for the same reason that most of today’s stockholders want equities: appreciation. I like the 30-year long bond because maturity matters to appreciation when rates decline. Thanks to compound interest, each percentage-point decline in interest rates increases the value of a 30-year bond more than it does a shorter maturity bond. If yields drop 1 percentage point -- say, to 3 percent from 4 percent -- the gain is 8.6 percent on a 10-year note, but it is 19.7 percent on a 30-year bond. That said, the losses are bigger on longer maturities if rates rise. I prefer Treasury coupon and zero-coupon bonds above other securities for three reasons. First, they have gigantic liquidity, with hundreds of billions of dollars trading each day, which means that only the largest investors can buy or sell without disturbing the market. Second, in most cases, they can’t be called before maturity. Issuers of corporate and municipal debt can call their bonds at fixed prices, meaning appreciation is limited when interest rates are declining and you’d like longer maturities. Even if the bonds aren’t called, the threat that they could be often restricts their ability to rise over the call price. But when rates rise and you prefer shorter maturities, you’re stuck with the bonds until maturity. And third, Treasuries -- despite the August 2011 S&P downgrade -- are still the best-quality issues in the world. Whenever an abnormal economic condition persists, theories are concocted to explain why it will last forever. And why not? The theory-spinners have very receptive audiences who enhance their credibility. Real GDP growth in the last six years has averaged 0.8% by my estimate, anemic compared with 3.4% in the previous, post-World War II years. So, right on schedule, theories have come out of the woodwork predicting sluggish economic performance forever. Until their data were corrected by a graduate student, Carmen Reinhart and Kenneth Rogoff convinced many that when government debt exceeds 90% of GDP (the U.S. is now almost at 100%), the economy contracts 1% annually. Columbia Business School’s Glenn Hubbard and Tim Kane see “the storm clouds of history” gathering on America’s horizon due to political inertia, antigrowth policies, eroding economic vigor and excess government spending. Sure, the economy is five years into deleveraging–about halfway through this gauntlet. But in about four years it will probably resume normal gains, even with a catch-up bonus. Productivity-rich technologies like computing, the Internet, robotics, biotech, telecom and additive manufacturing are far from fully developed. The Industrial Revolution started in England and New England in the late 1700s. It grew like Topsy, but it was only after the Civil War that it was big enough in the U.S. to turbocharge growth and productivity. No doubt, the Baby Boomers are aging. But their lack of retirement savings is forcing many to keep working. Unlike Europe, which historically exports people, the U.S. is a land of immigrants, legal and illegal. They will keep the labor force growing. Japan, by contrast, has the longest G-7 life expectancy, no immigration and low fertility. So it has a leaping pool of seniors to feed and a declining population. Europe will follow soon. With the one child per couple policy in China, the number of new labor-force entrants ages 15 to 24 is falling. In fact China is the only country that will get old before it gets rich. Don’t underestimate this nation’s indomitable entrepreneurial spirit. Consider the explosion of mobile communications and social media. In Japan and parts of Europe there is cultural antipathy toward entrepreneurs. The $400 billion annual U.S. current account deficit measures the extent to which foreigners recycle dollars to finance the federal deficit and other shortfalls. It’s dropped from an $800 billion rate before the Great Recession, and it will fall further as consumers continue their shift from a 30-year borrowing-and-spending binge to a saving spree, reducing demand for imports. Also, the shale oil boom means the U.S. is moving toward energy independence. This will reduce our geopolitical vulnerability in the Middle East. I expect that the dollar will reverse its long slide. My study of currencies since Roman times reveals that the buck will continue to prevail as a global reserve currency. The U.S. is the world’s largest economy, and second-place China is slowing as it shifts from being export-driven to domestically led. We have the globe’s deepest, broadest and freest financial markets. Our greenback is involved in 87% of international currency transactions. Despite the downgrade, foreigners continue to plow money into Treasurys. Sure, the U.S. has its problems. But dire forecasts of slow growth forever are just another case of theory built upon faulty facts. The revival of the U.S. manufacturing sector has been sufficiently robust to convince many Americans that a factory renaissance is under way. Boston Consulting Group predicted that increased exports promoted by stagnant U.S. wages and lower energy costs will result in 2.5 million to 5 million new jobs by 2020 and a reduction of the 7.3 percent unemployment rate by two to three percentage points. I also believe manufacturing is likely to continue its expansion. However, big gains in exports and jobs are far less likely. In 2010, President Barack Obama set a goal of doubling U.S. exports in five years, but he didn’t specify which countries would buy them. Deleveraging by global financial institutions and by U.S. consumers has been under way for five years. After past financial crises, this process of unwinding debt has taken about a decade. So despite the huge fiscal and monetary stimulus, deleveraging and the resulting slow growth of about 2 percent a year in U.S. real gross domestic product are likely to persist for another five years. In this environment, the traditional big buyers of global exports -- the U.S. and European countries -- have muted demand for everything. The U.S. manufacturing trade deficit remains at the high levels it reached early in this recovery. The total trade balance has deteriorated as the revival of consumer spending favored imports. Although exports are up 40 percent since 2009, they have leveled off recently and have a long way to reach the goal of doubling by 2015. 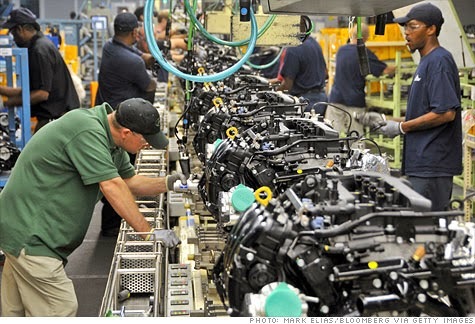 Manufacturing employment has revived, to 11.96 million in September, from a February 2010 low of 11.5 million. Still, that is a tiny increase compared with the 19.6 million peak in June 1979. Manufacturing output has picked up along with the economy, though with the sluggish recovery, it’s still below the 2007 peak. More important, productivity, as measured by output per employee, has resumed its robust long-term 3.4 percent annual growth rate. As a result, the gains in manufacturing jobs look more like an interruption in the long-run decline than a decided upturn. As measured by output per hour worked, manufacturing productivity has been rising at an annual rate of about 2 percent, far faster than total nonfarm productivity, which was flat in the second quarter compared with a year earlier. So, with compensation rising at about the same rate -- 1.7 percent in manufacturing year over year, and 1.6 percent for all nonfarm employment -- unit labor costs in manufacturing (the ratio of compensation growth to productivity growth) actually declined 0.4 percent year over year, though it rose 1.6 percent for the nonfarm sector as a whole. Wage increases have been rising more slowly than the consumer price index, which means real wages are falling. The good news is that falling unit labor costs, the result of low wage increases in a high unemployment economy and significant productivity growth, are retarding manufacturing output prices along with export prices. Nevertheless, U.S. real wages would need to drop much more than is likely in coming years to be competitive with those prevailing in China and other developing countries. China has increased minimum wages about 25 percent over the past year in the hopes of creating more consumer purchasing power as the country shifts from an economy led by now-weak exports and now-excessive infrastructure spending to a domestic demand-led economy. Also, with Chinese labor costs jumping, low-end manufacturing is shifting to lower labor-cost countries such as Bangladesh, Vietnam and Pakistan; Chinese production is moving to higher technology exports such as telecom equipment and computers. The result is that labor-intensive products such as textiles and shoes may only account for about 15 percent of Chinese exports. Also, even if Chinese hourly compensation rose at the extremely high rate of 25 percent a year, it would still take 15 years for it to climb from the $1.15 level in 2009 to the $35.53 an hour average U.S. compensation in manufacturing in 2011. With these labor cost differences, it’s not surprising that the U.S. share of global manufactured goods exports dropped to 11 percent in 2011 from 19 percent in 2000. Meanwhile, the European Union’s share fell to 20 percent from 22 percent, but China’s portion leaped to 21 percent from 7 percent. Today, U.S. exports to China only represent 20 percent of Chinese exports to the U.S.
Of course, global competitiveness in manufacturing isn’t only affected by labor costs. Logistics play a large role, tool. After the March 2011 earthquake and tsunami in Japan and the subsequent supply chain disruptions, many importers in North America and Europe looked for closer sources. But that interest wasn’t enough to overcome huge labor and other cost differences and cause large shifts of production to the U.S. and Europe. Instead, the disruption benefited low-cost producers, notably Mexico. Infrastructure is another concern. Anyone who has spent three hours in traffic getting from the Sao Paolo airport to downtown has a first-hand understanding of Brazil’s deficiencies. Then there is government bureaucracy and the accompanying corruption that adds to costs in developing countries. India insists that big-box retailers such as Wal-Mart Stores Inc. must buy from local suppliers as a condition for opening stores. Wal-Mart has thrown in the towel on expansion. China’s new leaders are trying to curb rampant corruption among Communist Party higher-ups, as exemplified by the recent trial and conviction of one-time party rising star Bo Xilai. Nonlabor costs are important. Boston Consulting Group estimated that this year, manufacturing labor costs in China are only 13 percent of those in the U.S. but the costs of materials, parts, containers, packaging and so on are 74 percent of those in the U.S. That means total costs are 93 percent of the U.S. average. That’s up from 82 percent in 1982, when Chinese labor costs were 7 percent of compensation for U.S. manufacturing workers.